The central question in the development of arguments that contest the future of the so-called Elgin Marbles is whether their removal from the Parthenon was legal – always with reference to the standards of the time. Lord Elgin's antiquarian researches, which resulted in the removal of the Parthenon sculptures and other antiquities and their transport to London, took place in 1801-1804 under the supervision of his paid representative in Athens, Giovanni Battista Lusieri. These researches began with a 'firman' which Elgin secured from the Porte in July of 1801, exploiting the circumstances of the time, which were particularly favourable to Great Britain, and, no doubt, his position as ambassador of Great Britain in Constantinople. Today it is generally accepted that the firman was expansively interpreted by the Turkish authorities, while during the following years repeated transgressions occurred as a result of continuous bribery of local officials. But according to those who support the legality of Elgin's activities, any possible illegalities that occurred were legalized in retrospect in February, 1810, when a new firman gave permission for the export of the second large collection of marbles which Lusieri had procured for Elgin (the first had already been sent in 1803). 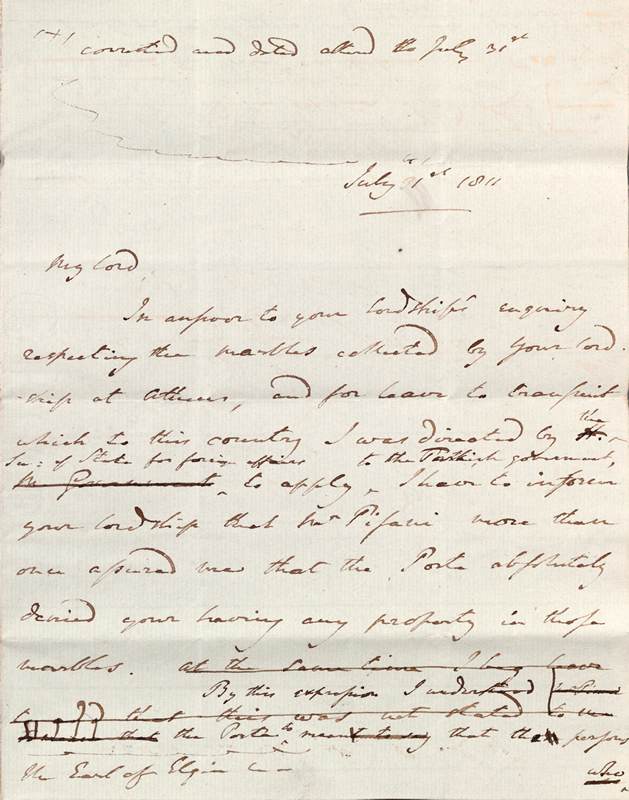 The existence of a previously unknown letter from Robert Adair (1763-1855) to Lord Elgin gives a new turn to the discussion. The letter reveals the position of the Ottoman authorities with regard to the legality of the acquisition of Elgin's collection. This letter is particularly valuable for two reasons: firstly because Adair was the head of the British delegation in Constantinople during the period 1809-1810, and secondly because it was due to his endeavours over a period of many months that the famous 'firman' of 1810 was issued. Let us say first of all that the authenticity of the letter (or rather the draft which has been preserved) is beyond question. Both the ink and the paper are from the period when the letter is dated. 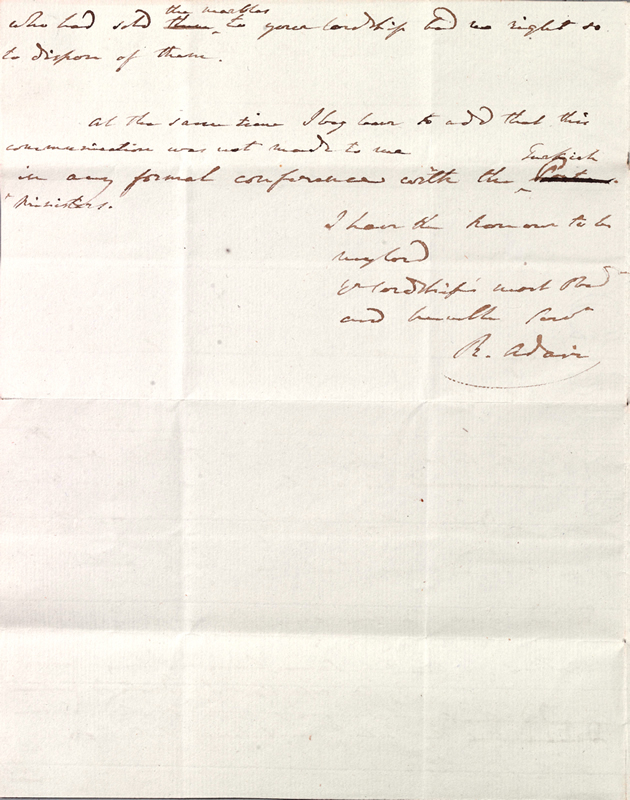 In addition, a comparison of Adair's handwriting from existing letters with that of the letter under discussion clearly proves that the letter is in his hand. In any case the contents can be verified from already published but little-known sources of the period, as we will see below. In answer to your Lordship's enquiry respecting the marbles collected by your Lordship at Athens, and for leave to transmit which to this country I was directed by the Sec(retary) of State for foreign affairs to apply to the Turkish government, I have to inform your Lordship that Mr Pisani more than once assured me that the Porte absolutely denied your having any property in those marbles. By this expression I understood the Porte to mean that the persons who had sold the marbles to your Lordship had no right so to dispose of them. At the same time I beg leave to add that this communication was not made to me in any formal conference with the Turkish ministers. Before attempting an evaluation of the contents of the letter, let us see what the state of Elgin's affairs was at the time Adair's letter was written, and what might possibly have provoked Elgin's letter, no longer extant, to which it replies. A year and five months had passed since the issue of the firman which allowed the second collection of antiquities to leave Piraeus for Malta. Elgin's first attempt to sell his collection to the British government had fallen through the previous May. This failure was due to the fact that while Elgin was asking more than £60,000 for his collection, the Prime Minister was reluctant to request even £30,000 from Parliament. It seems that various rumours were circulating in London at the time about the way in which he had acquired the collection, the most serious of which was that the Turkish government considered that the removal of the marbles was illegal. Afterwards Lord Elgin came to say that he had made up his mind to sell his collection, including marbles, casts, moulds, and drawings, for the expenses which he had incurred; the amount to be valued by a committee of the House of Commons. He waived all question about the property, and title to them; considering them however to be wholly his own; in which he was recently confirmed by Mr. Adair, our late Minister at the Porte, who says that he was expressly informed by the Turkish Government that they entirely disavowed ever having given any authority to Lord Elgin for removing any part of his collection, and did still refuse to allow the removal of some articles remaining behind. On receiving your separate despatch respecting the antiquities collected by Lord Elgin in the Levant, I did not fail to renew the application which I had already made privately to the Ottoman Government for permission to embark them at Athens. The preliminary steps towards their embarkation not having been taken under the sanction of a firman, I have met with much difficulty in forwarding his Lordship's wishes, and even now it is very doubtful whether the object would be effected so certainly through a firman as through a private application to the Vaivode of Athens. Here Adair refers diplomatically to the heart of the problem. With the expression 'The preliminary steps towards their embarkation' he refers of course to the 'steps' starting with the removal of the marbles, to their transport to Piraeus. Thus we have one more piece of evidence that the Turks never accepted that the firman of 1801 covered fully all of Elgin's actions, as his modern supporters frequently maintain. There is no doubt that Elgin was aware of the rumours against him. He would probably have considered them responsible, to a great extent, for the recent failure of the negotiations with the Government for the sale of his collection. He decided, therefore, to write to the Prime Minister, Spencer Perceval, in order to resolve the 'misunderstandings'. It may well be that first he felt it advisable to ask for explanations from Robert Adair, who appeared to confirm that his activities in Athens were illegal. Adair's answer came with the letter we have published above. It is the first time that the view of the central authorities in Constantinople with regard to the Parthenon marbles is presented in such a clear and explicit way. The Porte declares outright that it denies absolutely that Elgin had any sort of rights of ownership in the marbles. Adair's evidence acquires great significance if one takes into account the fact that it comes from the most credible figure on the British side: the British ambassador to Constantinople. Pisani, who conveys the position of the Ottoman authorities to Adair, is none other than Bartolomeo Pisani, who was chief interpreter of the British embassy for many years. It was he who negotiated the firman of 1801, and was, as a consequence, the man most cognisant of the affair. That the Turkish officials gave their reply to Pisani, and not to Adair, is due to the fact that permission was not requested directly by Adair, who, perhaps, was aware of the inflexible stand of the Turks concerning the question of ownership in the marbles. Moreover, we know that once before he avoided a direct request. Adair's letter contains another interesting element, which is put for the first time. This is the reference to persons from whom Elgin was supposed to have purchased the marbles, most probably the authorities of Athens (the voivode, the disdar), who may well have given Lusieri a receipt of sale for the sums which they received as bribes. Note that C. R. Cockerell received a similar receipt for the marbles from Aegina. From this time forward Elgin never again stated that he had purchased the marbles. I had no advantage from the Turkish government beyond the Firman given equally to other English travellers. My successors in the Embassy could not obtain permission for the removal of what I had not myself taken away. And on Mr Adair's being officially instructed to apply in my favour, he understood, "The Porte denied that the persons who had sold those marbles to me had any right to dispose of them". Thus, in order to prove that he had not received special favours from the Turks, Elgin invokes the difficulties which he met in the course of exporting his collection. At the same time he advances as additional proof of their unfriendly attitude to him, the denial by the Porte of the legality of the supposed sale of the marbles, skilfully leaving open the possibility that he had in fact acquired them by purchase. At this point we should emphasize that although this manoeuvre of Elgin's may seem dangerous to us today, there is no doubt that at the time it was made, it served his interests. In fact, the question of the legality of his activities in Athens becomes important only after the foundation of the Greek state, when for the first time the question of the return of the marbles was raised. Elgin's great fear was that it might be proved that he built his collection by exploiting his position as ambassador. If this could be proved, the marbles would automatically become the property of the British government, and Elgin would receive, under the best circumstances, only a small compensation. Whereas it did not concern him greatly if certain illegalities of his in the Levant were to become known. The possibility of the Turks' claiming the marbles was minimal, and the prospect of the return of the marbles to Athens completely unreal. We must remember that for Britain at that time Turkey was a barbaric country, with whom she had hostile relations at various periods. It is clear that Adair's letter to Elgin, when seen together with the existing sources, offers a new approach to the problem of the legality of the removal and export of the Parthenon marbles. The entire letter reveals the stable and unchanging position of the central authority, as it was expressed from the moment that what was happening in Athens became known: this was not a decision of the moment, the result of a happenstance confrontation of the question, influenced by the self-interested calculations of certain officials. It was this position of the Porte that explains the great difficulties which Lusieri confronted, particularly after the departure of Elgin from Constantinople. And it was the communication of this position to Elgin's successor, William Drummond, which explains the latter's negative stand against the antiquarian activities of his predecessor. In fact, the position of the Turkish government vis à vis Elgin is consistent with a long tradition of respect for the monuments of Athens, which may have its roots in the admiration of Mehmet the Conqueror for the 'city of philosophers'. Finally, in view of the foregoing, the argument of an a posteriori legalization by the firman of 1810 is considerably weakened. We know nothing of this firman, which has not survived: under what circumstances it was issued, whether there were any presuppositions for its application, and, if so, whether these were respected. Most importantly, when Adair, who negotiated the firman, writes to Elgin a year and a half after its issue to express the position of the Ottoman authorities concerning his collection, he makes no mention of the firman or of any change in the Porte's position, which such a firman would have brought about. As V. Demetriades correctly notes, the term firman is misused in this case. See V. Demetriades, 'Was the removal of the Parthenon marbles by Elgin legal?' (document included as Appendix A to the submission of the British Committee for the Restitution of the Parthenon Marbles to the House of Commons Select Committee, 2000). In fact it was a document signed by the deputy of the Grand Vizier. The same is true of the firman of 1810. The permission of the central authorities was necessary for Elgin's researches, since the Acropolis belonged in part to the state and was a fully militarized zone. For the legal side of the question see D. Rudenstine, 'Lord Elgin and the Ottomans: the question of Permission', Cardozo Law Review, vol. 23, 2002, pp. 449-471. For a chronicle of Lord Elgin's activities in Athens, see A. H. Smith, 'Lord Elgin and his collection', Journal of Hellenic Studies, vol. 36, 1916, pp. 163-372, and W. St. Clair, Lord Elgin and the Marbles, Oxford, 31998. With thanks to Mr. C. M. Woolgar who sent me examples of Adair's handwriting from his letters in the collections of the University of Southampton. The draft of the letter is written in ink on the first and second pages of a bifolium, 4to (243x190 mm), the third page being blank, while the fourth bears the annotation: Corr[espondence]: / Lord Elgin / 1811, and traces of pencilled notes now almost erased. On the lower section of the first page the addressee: The Earl of Elgin. The paper bears the watermark: C. PIKE / 1808. The edges are gilded. We give the final text (after corrections, additions and cancellations) and we footnote only those portions of the text in which there is an essential change of meaning. The 3 was placed before the 1 at a later date, it was immediately erased and then a cross was placed over it which refers to the following note at the top of the page: (+) corrected and dated (and) altered to July 31st. The Sec(retary) of State for foreign affairs: this replaces the crossed out: H. M. Parliament. the Porte to mean: this replaces the crossed out: Mr Pisani to mean that the porte meant to say. Turkish Ministers: this replaces the crossed out: Porte. In fact the first part of the collection (the so-called 'first collection'). The second collection reached London in May of 1812. C. Abbot, Diary and Correspondence, London, 1861, vol. 2, pp. 326-327. R. Adair, The Negotiations for the Peace of the Dardanelles in 1808-9, London, 1845, vol. 1, p. 272. On Pisani see A. Cunningham, 'The Dragomans of the British Embassy at Constantinople', Eastern Questions in the Nineteenth Century, London, 1993, vol. 2, pp. 3-9. A. H. Smith, op. cit., p. 278. W. St. Clair, op. cit., p. 202. On the contrary, in a letter from Elgin to Charles Long dated 6th May, 1811, he states: The objects were not purchased, or got for fixed prices. See A. H. Smith, op. cit., p. 310. A. H. Smith, op. cit., p. 312. Adair's letter to Elgin, and Elgin's letter to Perceval are both dated 31st July. This means that either the first arrived on the same day as it was dated, or that the second was predated. It seems that Adair's letter was sent after a considerable delay, if we judge from the correction of the date from the 1st to the 31st of July. Smith makes no reference to this paragraph. It is noted by Charles Hitchens in The Elgin Marbles. Should they be returned to Greece?, London, 1987, p. 52. D. Rudenstine, op. cit., p. 456, n. 45. Translated into English by Leonora Navari. First published in Greek, in Ta Istorika, vol. 20, Athens, 2003, pp. 509-517. What is the family name of the American President? Copyright © 2019 Adair to Elgin. All Rights Reserved.